WORLD FARE: Does Shakespeare’s have the best fish ’n’ chips anywhere? “These are the best fish ‘n’ chips I have ever tasted!” The words wouldn’t necessarily have meant much to me, except that they were spoken by my friend Martin Nielson in his erudite English accent (one defying his Midlands origin) a little more than an hour after disembarking from a British Airways flight from Heathrow. This was someone who knew fish ‘n’ chips. These were not words to be ignored. And he may very well have been right. The fish ‘n’ chips at Shakespeare Pub & Grille at the foot of Mission Hills (3701 India St.) are clean and wonderfully crispy on the outside, moist and nearly sweet on the inside. If they’d been served in the traditional English style (on newspaper) the newsprint would have been entirely un-smudged by grease and completely legible. The chips—what we call french fries (what we call “chips,” they call “crisps”)—are nearly as good as the fish and at their best when accompanied by English-style brown sauce that’s somewhat similar to A-1. Fish ‘n’ chips—called “the good companions” by Winston Churchill—are battered and deep-fried fish served with chips and, most often, salt and vinegar. Once upon a time, and not so very long ago, they were England’s national dish. Now, few would disagree, that honor goes to curry. But fish ‘n’ chips retains a central hold on the English psyche. The idea that our local version is superior is still quite odd to me, and to Martin, as well. And yet it may be so. Shakespeare is an old-school English pub featuring classic pub food. There’s no modern English gastropub fare here. And, in truth, not all of the classic pub food at Shakespeare is as good as the fish ‘n’ chips. The steak and kidney pie was, frankly, leaden. The balance between crust and pie filling was skewed heavily toward the crust. The overall flavor of the filling was mono-dimensional—that dimension being salt. The chicken pot pie and the curry are better. And there’s no superior drinking food than Scotch eggs (deep fried, of course—heck, they deep fry Mars bars). But the atmosphere at Shakespeare makes up for any minor shortcomings in particular dishes. The place looks and feels like an English pub. It certainly does so at night and, if anything, still more so on Saturday morning with the Premiership football (soccer) games on. There’s no better place than Shakespeare for the gathering of a tribe of fans of some obscure English team (such as mine, Leeds United) than their rare appearance on a stateside telecast. Shakespeare is clearly the ultimate San Diego place to watch an England World Cup game, though the quaint charms of queuing in the early-morning dark might be something lost in translation from English to American. And, no doubt, eating Shakespeare’s Full Monty breakfast (rashers—English bacon—two fried eggs, grilled tomato and fried hash-brown potato cakes) in front of a game is the next best thing to watching a match in England. Interesting, have always heard Shakespeare’s Pub is a good place to watch soccer matches and they sell English food products but had never heard anything (good or bad for that matter) about the food. 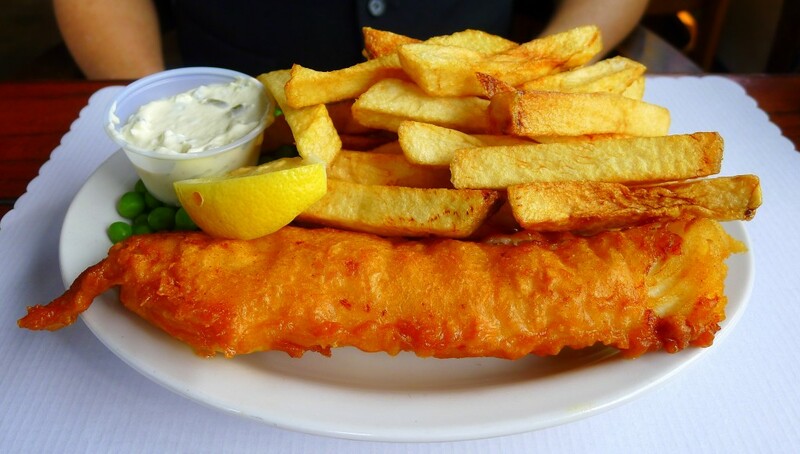 If the tartar sauce that accompanies those fish and chips is pretty good as well might just order this when I get around to visiting the place.